Last weekend, I have catched up with Oliver and Joyce, and we have managed to do couple of photos in a Gemini Floristry. The area was very photogenic with cute little different corners. 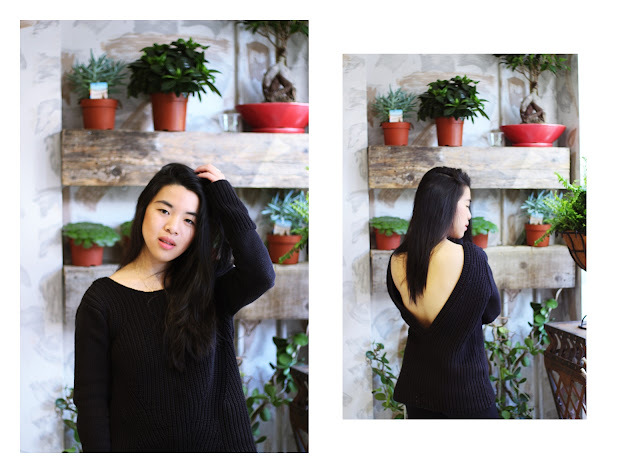 Black will be always my loyal colour, and I took out this V back sweater from Zara out, because last days was very British weather over here, moreover backless detail will at least make the whole monochrome outfit a bit more interesting. To add at least some lively colour to my whole black colour outfit, I paired it with my golden shiny sneakers, that are just saving any monotone outfits! Remember, that little details are as important as the whole feel of the look. Details highlights the whole feel of a monochrome outfit.